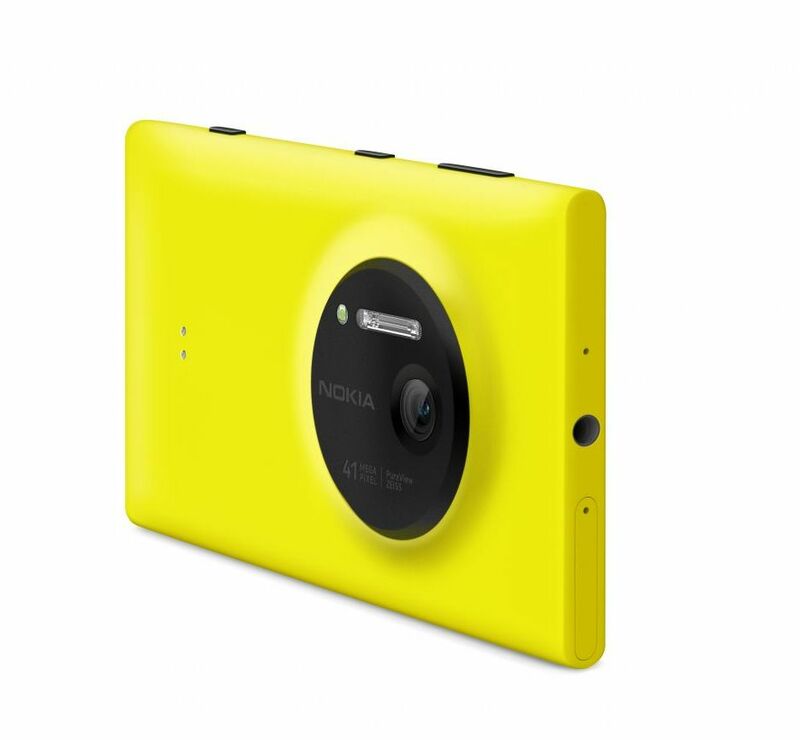 Review Nokia's marketing department is comparing its new imaging champ, the Lumia 1020 smartphone, to digital SLR cameras. That's just silly. But what the Lumia 1020 can lay claim to is that it takes the best photos of any current modern smartphone – by a clear head and shoulders. And Nokia has packaged it into a modern phone, rather than an exhibit at hardware manufacturer's freak show. It isn't perfect, and it could use a few tweaks. But as it stands, considering that the competition from Apple, Samsung and HTC's smartphones is strong, this is impressive. Even against Samsung's Frankenstein-like hybrid, the S4 Zoom, which clumsily grafts the optical lens from a point-and-shoot digicam onto a budget Android smartphone. Now, perhaps for the first time, a phone can take photos with a level of richness and detail good enough for posterity – for the mantelpiece or a family album – rather than for Facebook. What you really need to know is: is it any good as a phone, particularly if you're coming from a rich ecosystem like iOS or Android? And what exactly does this much vaunted 41 Megapixel monster deliver? Obscure geekspeak, or real world results? Before we do let's briefly run over the device and the accessories. The Lumia 1020 actually integrates two imaging technologies: a highly novel one developed by Nokia over several years, and one borrowed from dedicated cameras but miniaturised into a phone. Both are unique to Nokia. However, both have appeared before, never together, and the combined result is amazingly, smaller than the predecessors. The first is an unusual approach that uses silicon and software to compensate for the physical limitations of a short focal length and small aperture. Instead, a huge sensor captures many more pixels than you need, and then software algorithms distil this down to a five-megapixel image of great richness and detail. The sensor is 41 megapixels, creating as a first step a 34 megapixel image; the other pixels being put to good use interpolating the image. For a technical explanation, see here. The phone actually keeps a master copy of the image at full resolution, and presents the five-megapixel image to you right away for editing and sharing. 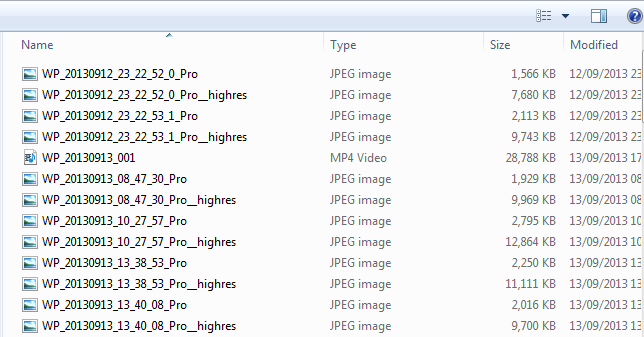 This smaller, distilled image is also uploaded to SkyDrive. The second technology appeared last year - and brings the optical image stablisation (OIS) found in dedicated cameras to a phone. This first appeared on the Lumia 920 and 925 models, and it allows for very stable video recording, and some startling photos in poor light, as the shutter can be exposed for longer than it would otherwise be. In the 1020, the entire imaging module itself is mounted on ball bearings (rather than on gyroscopes as in the 920 and 925), and the camera compensates for a shaky hand or wobbly undercarriage in real-time. The results of the gazillion-pixel sensor aren't as huge as you might fear. 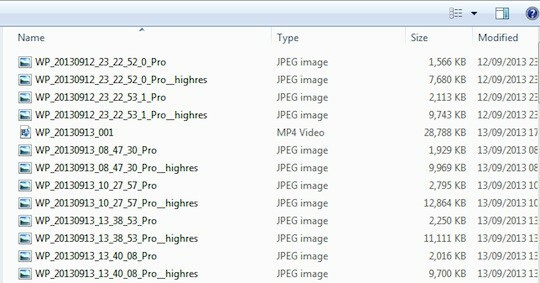 Here's the image folder viewed in Windows Explorer - the smaller image varies from 1.5MB to 2.7MB in size, while the “master” doesn't really exceed 9MB. Your phone won't get full in a hurry from taking lots of pictures - it's HD video recording that's the real hog. You can't actually access the “master copy” from the phone, but in practice, you don't need to: the five-megapixel is superior every time. The 1020 is the second phone on the market to feature the huge sensor developed by Nokia. Remarkably Nokia achieves all this in a fairly slimline package: the design goal for the imaging unit was 10mm, and the phone is 10.4mm thick; the imaging unit protrudes by around 3mm. Rather, the mechanics are spread laterally, giving it a very distinctive look. Nokia had to invent a new kind of sensor, a type of Xenon flash, and new manufacturing techniques to make all this possible. Yet the proof's is in the pudding, not the specs. Before taking it through its paces, we'll briefly review the build and software.